When I first saw the sign for Trust restaurant, I rolled my eyes a little. Was this yet another one of those hippie-dippy joints where each self-important dish has its own 1984-style doubleplusgood name? After stopping in one afternoon just for a look around and a refreshing and spicy cocktail made with jalapeño tequila and firewater bitters, I breathed a sigh of relief. The menu was diverse and interesting, described by the restaurant as “urban rustic,” and the staff was welcoming and unpretentious. David and I made it in for dinner on a Tuesday night, and the place was packed. We were able to grab the last available table. Taking in the menu, the first thing I noticed were the unusual ingredients being used in otherwise familiar dishes. 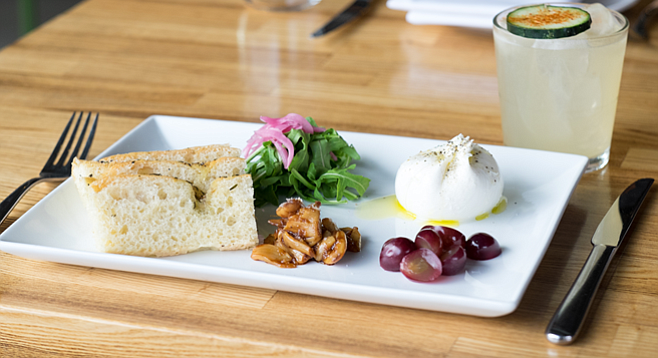 These are the ones we gravitated toward, beginning with the Burrata, which came with sweet garlic, pickled grapes, house focaccia, arugula, and sea salt ($14). This was my first time tasting pickled grapes, which I’d only just begun to hear about (namely, in an episode of the last season of Top Chef). I expected it to be vinegary, but instead it was a bright, almost tart sort of sweet, which was an excellent complement to the burrata and its generous sprinkling of sea salt. The sweet garlic was made so by the sweet vermouth in which it was pickled. Each item was presented separately, allowing diners to assemble their own flavor combinations. The combo of the pickled grapes and burrata was our favorite. I’ve been over brussels sprouts for a while, especially as we’re well into spring and approaching summer, but when I saw the preparation my curiosity got the best of me. This version ($10) came with tortilla strips, jalapeño vinaigrette, cotija cheese, and tajín. The masa flavor and satisfying crunch of the thick corn tortilla strips complemented the sprouts in a way that made me wonder why this wasn’t the way sprouts were always served. David has vowed to try this at home. We learned from our server that chef Brad Wise found inspiration for this dish after a late night of drinking and a bag of salsa verde–flavored Doritos, which made us like the dish that much more. David ordered the Steamed Clams, with housemade ’nduja salami (a spicy, spreadable pork salami), fennel, wine, herb butter, and grilled bread ($14). I’m not a fan of clams. It’s a texture thing. But I did taste the sauce and found it to be spicy and savory, more meaty than briny, and I gladly accepted David’s offer to share the bread so I could sop some up. I’ve been on a Mediterranean kick, so I ordered the Wood Grilled Lamb Meatballs ($16) with lentils, tzatziki, pickled shallots, Fresno chiles, and mint. Though all the ingredients melded well, and I appreciated the blend of hot chiles, cool tzatziki, and sweet pickled shallots, something in the dish was overly salted, which eclipsed what would have been a perfect combo. For dessert, we ordered the Profiteroles — a tall tower of them, each filled to the brim with fresh, cool banana cream and the whole stack showered with caramel. We managed to split only one and brought the rest home to enjoy the following day. David pointed out how unusual but nice it was to have these puffy pastries filled with banana cream rather than the typical vanilla. There’s a weekend brunch on the patio overlooking Park and Robinson and many other creative flavor combinations that we’re excited to sample. When we return, we’ll be sure to bring a crew so we can taste around the menu.